We were delighted to receive Distinctions and Merits for our Burren Beo projects today. Kate, from Burren Beo, visited us again to bring our certificates. We have learned do much about ‘Our Place’, and we promise to keep be our school, our homes and spaces litter free! check out there website www.burrenbeo.com for more information. 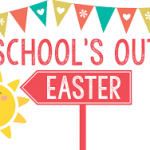 School is closed for two weeks for Easter holidays from 15th April to 26th April inclusive. Tubber Road Building will close at 11:50 and Convent Building will close at 12:00 on Friday 12th of April. 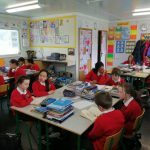 Pupils are enjoying their buddy reading this week at Gort N.S. It’s a great way to give voice to the fantastic readers we have. 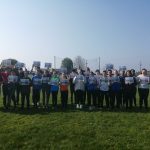 Once again, a huge thanks to Supervalu for their generous donation of Gaelic footballs to our school. It is much appreciated. Well done to all the girls who recently received camogie county medals. It’s great to see more and more girls participate with the local club. Year after year I think it just gets better! We thoroughly enjoyed our day last Saturday in UL for Peace Proms. The whole day went really well and the children sang and moved brilliantly. Can’t wait for next year already!! Gort National School will close early for pupils on Monday 21st of January to facilitate a staff meeting. Tubber Road Building will close at 12:20 and Convent Building will close at 12:30.